Welcome to our gallery of the best lagoon swimming pool designs. 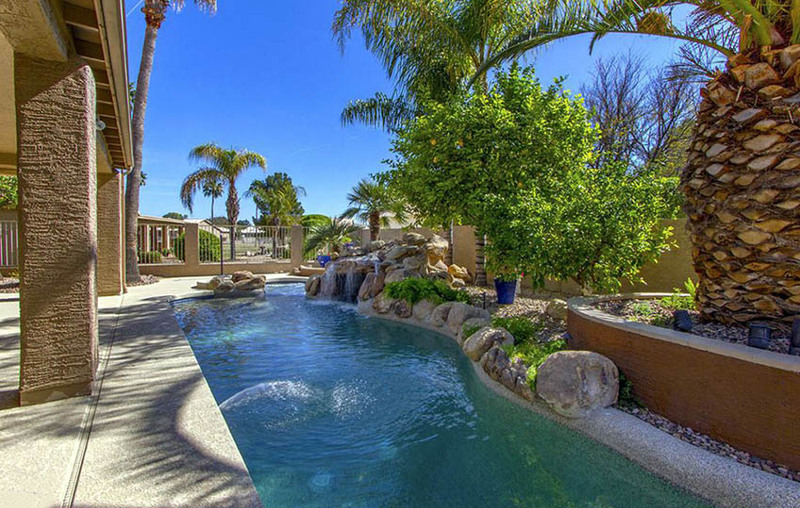 This gallery features a wide range of different pool styles, water features, and information about lagoon style pools. 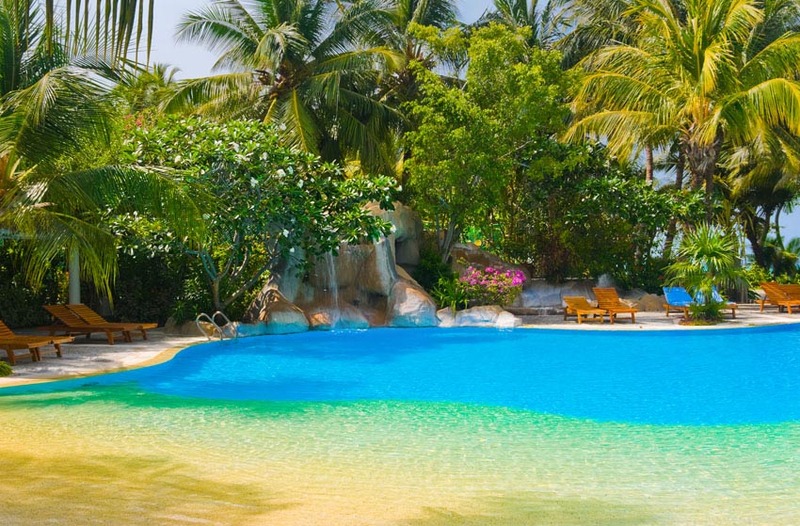 Lagoon swimming pools are great for their curvilinear forms and more tropical, natural vibe. Read on to discover the most popular features of lagoon pools and see how they utilize water features to create a natural environment. 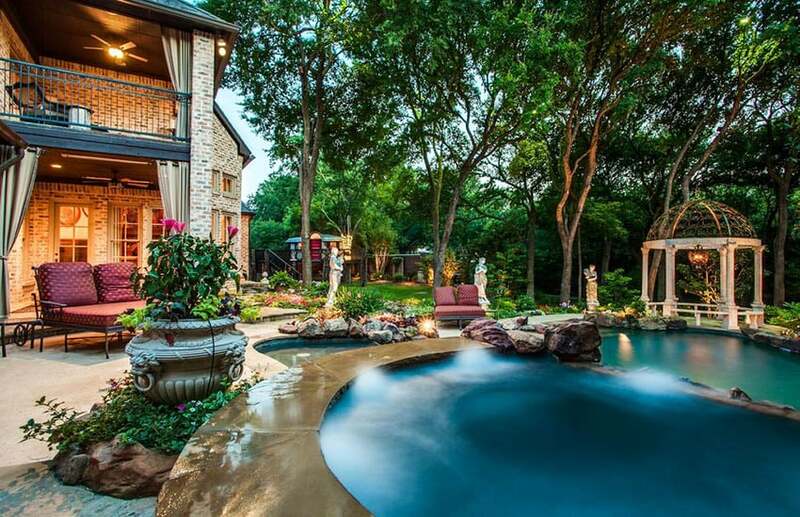 Lagoon-style swimming pools are famous for creatively recreating the feel of a backyard oasis. 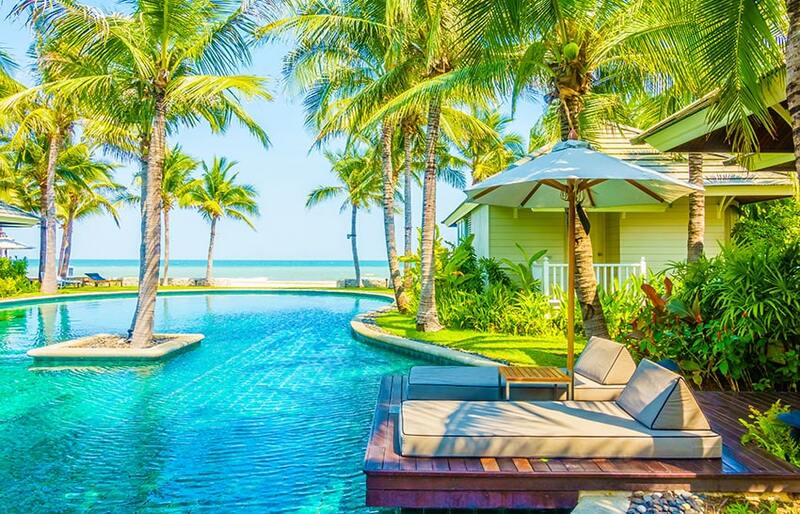 The tropical aesthetic achieved by these types of swimming pools make them enduringly popular to plenty of designers and homeowners. There are two defining features of lagoon swimming pools – their freeform shapes and their design features. The freeform shapes attempt to create a more organic feel to the pool, adding curvilinear swoops and gentle curves. At times, they have inset islands to accommodate palm trees or other landscape elements. 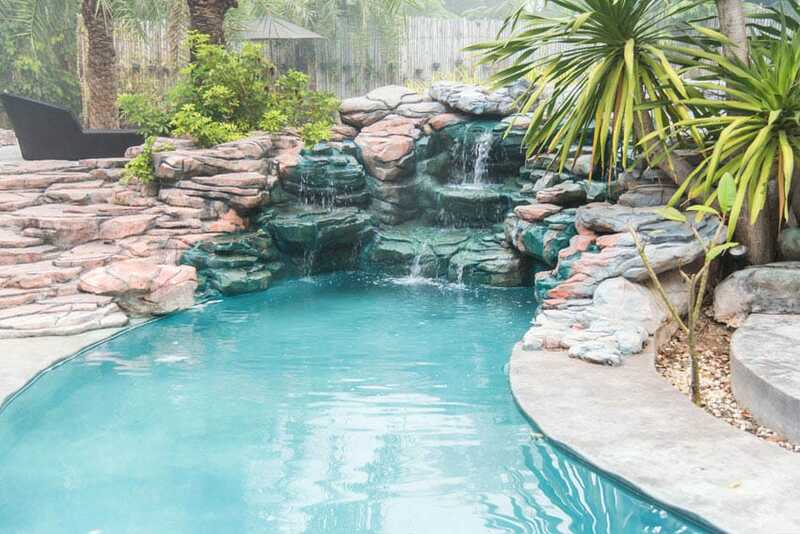 The design features that are quintessential to lagoon style pools include waterfalls, rock sides, black bottoms, and whatever else adds to the experience of making the pool feel tropical and organic. There are a slew of creative and practical benefits to opting for the use of lagoon swimming pools as opposed to the equally common rectilinear type swimming pools. The pleasing curves inherent in these types of pools are limited only by your imagination. It’s called “free”-form for a reason. The curves can practically also be used to accommodate a pool in spaces that are not very conducive to outdoor water-based recreation. Irregular corner lots or cramped backyard spaces, for example, can now afford to have pools in them in the form of freeform lagoon style swimming pools. Lastly, lagoon swimming pool designs can have added design features such as wading niches, refreshing waterfalls, and tanning ledges that only serve to enhance your swimming pool experience. 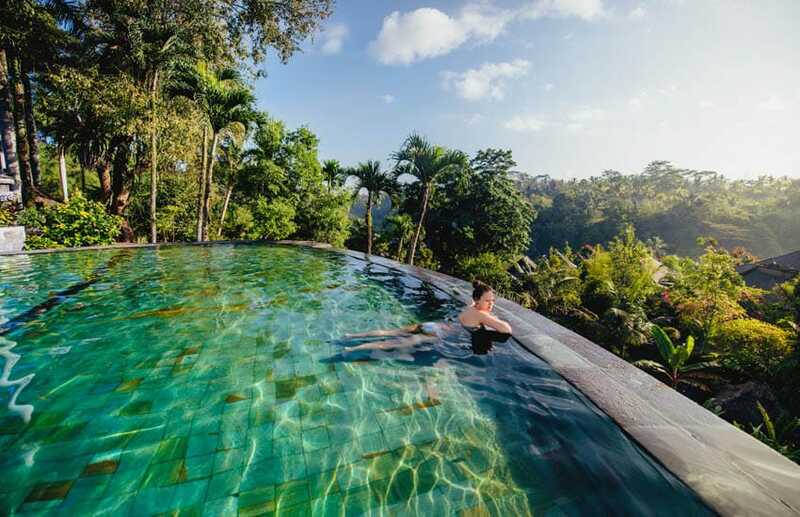 Lagoon pools are perfect for forest-side views such as this one. Lagoon shaped pools are the most diverse sub-genre of swimming pools in landscape design. This is due to its characteristic of employing free-form and curvilinear layouts with almost limitless creative potential. Free-form or lagoon shaped pools are close cousins to kidney-shaped pools, and are sometimes called radius pools due to their curvilinear nature. The more popular shape common for lagoon pools nowadays is called the cloud or bubble, named aptly after the perceived form of those pools. The flowing and smooth sweeps and curves of these pools very faithfully depict the true essence of tropical landscape design. Lagoon shaped pools also commonly employ niches or pockets for different landscape elements. 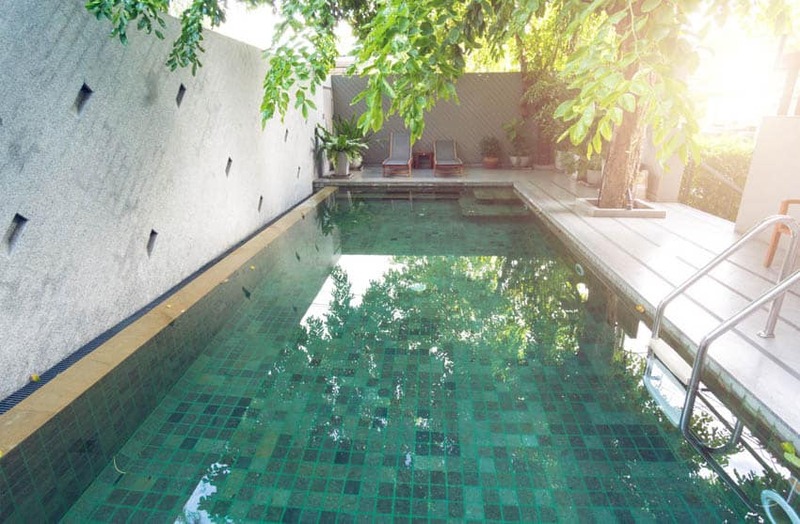 Trees and shrubberies integrated into the pool design not only provide a nice source of shade from hard sunlight, they also add a heap or aesthetic value to the pool, not to mention the backyard as a whole. The niches or pockets are also commonly utilized for tanning ledges, perfect for a relaxing dip in the swimming pool while also getting that nice, sun-kissed summer complexion. Curved lagoon shaped pools do wonders for irregularly shaped lots and can adapt to any lot shape. However, they also serve as nice contrasts to sharp, regularly shaped backyards by softening the edges and corners of the property with their gentle curves. When it comes to swimming pool construction, they will typically consist of one of three major materials: gunite, fiberglass, and vinyl. Gunite is the most expensive yet durable of the three. This material, in its simplest form, is sprayed-on concrete with steel reinforcement bars. Due to its durable construction, it is known to last a lifetime. Fiberglass is not as pricey as gunite but not as affordable as vinyl. Fiberglass pool linings are resistant to algae buildup and require short installation times. Vinyl lining for pools is the most affordable option of the three. A continuous sheet of vinyl on the topmost surface of the pool separates the pool water from the subsurface of mortar and sand. Vinyl pools are versatile and less prone to cracks. 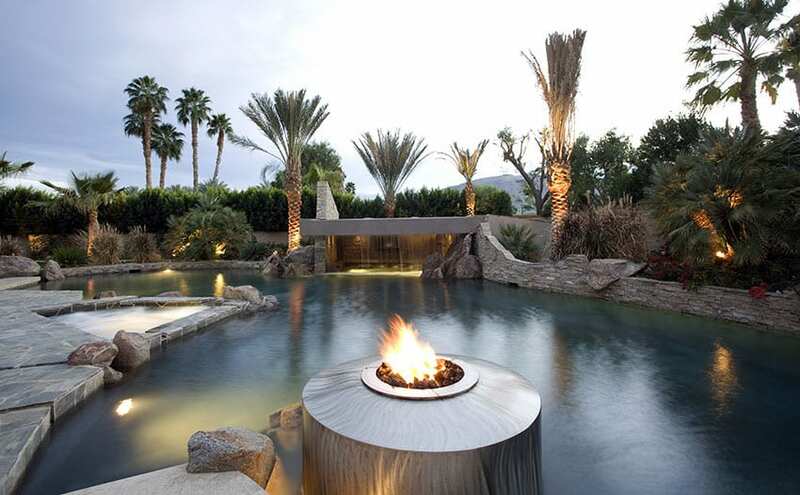 Adding a modern fire-bowl to your lagoon pool is a stylish way to give an exotic ambiance, and add some warmth and light for nighttime swimming or backyard entertaining. Lagoon style pools employ different design features to enhance its look and to enhance its users’ experience. 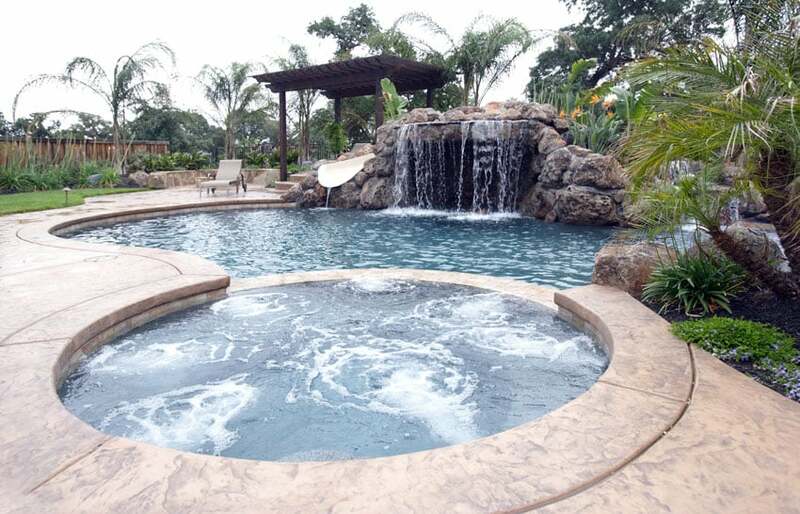 Rock waterfalls are some of the most common design additions to lagoon style pools. These serve as perfect complements for lagoon style pools and really add to the ambiance of the scene. They are great visual and acoustic design elements. When used correctly, they can help mask any unwanted views or noises that might take away from the appeal of the lagoon style pool. 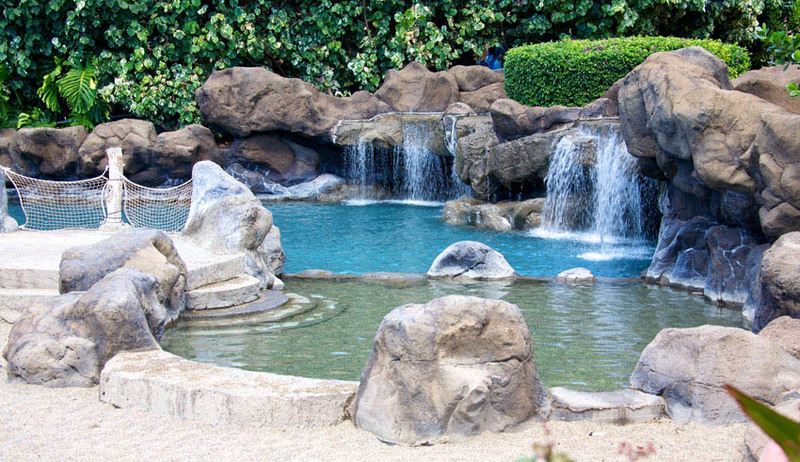 When recreating nice rock waterfall scenes for your lagoon style pool, it is good to consult with your contractors and suppliers the feasibility of using either synthetic of natural rocks. Depending on your location and the availability of supplies, finding the right balance between artificial and natural will keep costs low and aesthetic values high. Cave features and grotto additions are also quite popular design features for lagoon style pools. These man-made nooks serve as intimate spaces for relaxation or privacy. Depending on the design, these niches can also serve as bars, spas, and even shower rooms. As mentioned before, smart landscaping is also seen in many lagoon style pools. For the most part, popular choices for tree or shrub landscaping are tropical species – usually palm trees and foliage with sprawling, wide-set leaves. These types of plants enhance the tropical vibe of the lagoon style pool and make it look much more organic and natural. Although sometimes quite difficult to maintain due to their preference for more humid, tropical climates, the presence of a pool and some other climate-centric landscape modifications will help sustain these tropical plant species. This makes it possible to utilize them even in areas with generally colder climates. Outdoor lighting is also an essential design element to really make your lagoon style pool design stand out. Color-changing submersible LED light strips can really give your pool an otherworldly glow especially at night. We also have pool lighting specifically purposed to illuminate walkways and landscape elements for visual clarity in less than ideal conditions. Even smaller backyards can accommodate lagoon pools thanks to their freeform shapes. 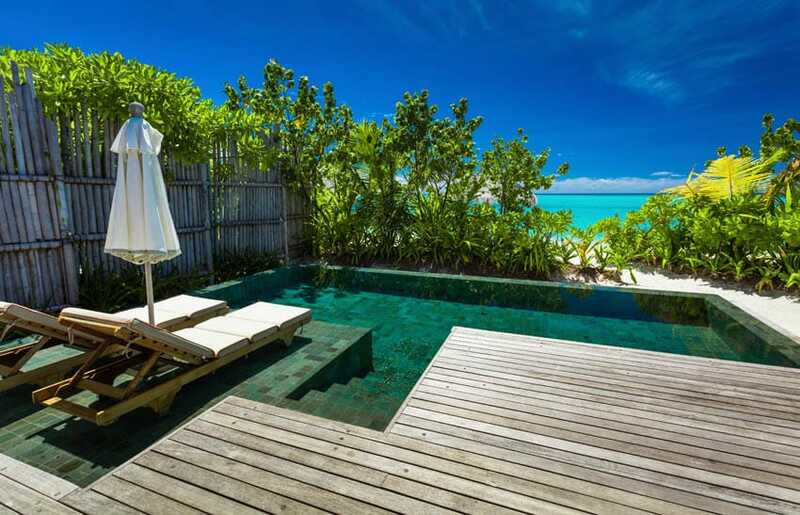 This lagoon swimming pool features a beach entry design to resemble a real tropical beach. Like any other type of major construction, lagoon style pool prices will fluctuate depending on materials and layouts preferred. Given their freeform nature, lagoon pools have a very slightly higher price than simpler layouts such as kidney shaped pools or rectilinear pools. 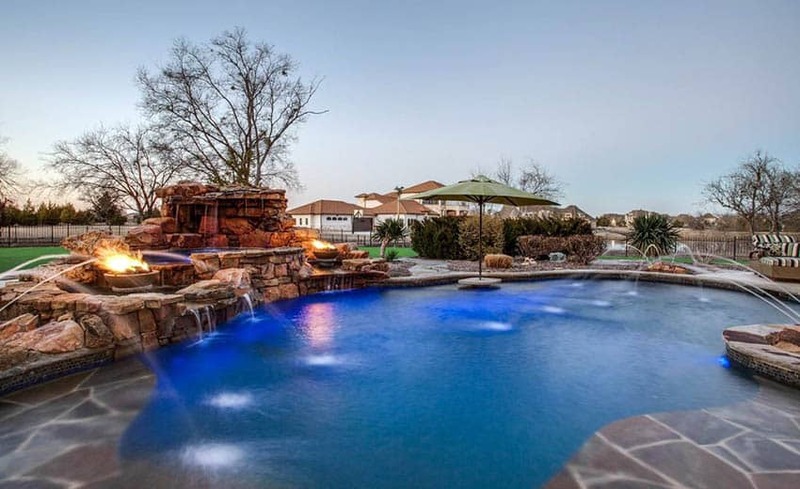 Add the price of ancillary features a client might want to add such as waterfalls, pool islands, or built-in fountains and your budget also goes up a tad. For quick and easy installation and affordable prices, homeowners might want to go for above-ground lagoon pool kits. Cheaper materials such as vinyl or fiberglass will also affect the cost of the construction. Regional considerations must also be given thought. Local higher water tables, soil conditions, aquifers, and other digging conditions will make construction a bit more complicated. These, in turn, affect the price for labor and construction. Southern parts of the country, for example, will have mostly tropical weather for a majority of the year. Not having to worry about frost and winter climates can make it so that there is a larger window for construction. This is especially true for outdoor construction and landscaping projects such as lagoon pools. Climate also affects the type of vegetation you can utilize for your lagoon pools. More harsh climates will limit the plants you can use, and more high-maintenance plants will not only cost more to obtain and plant, but also to water and groom. Here are some sample lagoon style pool costs sorted according to size and price, the size indications being dimensions of the three larger curves of the pool. On average, a square foot of lagoon style pool construction will cost you $70. This is assuming the bare minimum of lagoon style pools. Taking into consideration extra costs for landscaping and additional design elements, these pools will be at $100 per square foot. This is assuming the labor of a five man crew at two weeks of uninterrupted work. As always, try not to forget about extra costs affecting the overall budget of construction, such as local building permit fees and applicable taxes. Consultants and installers in your area will most likely be more knowledgeable on those matters, so don’t be afraid to ask them for advice. 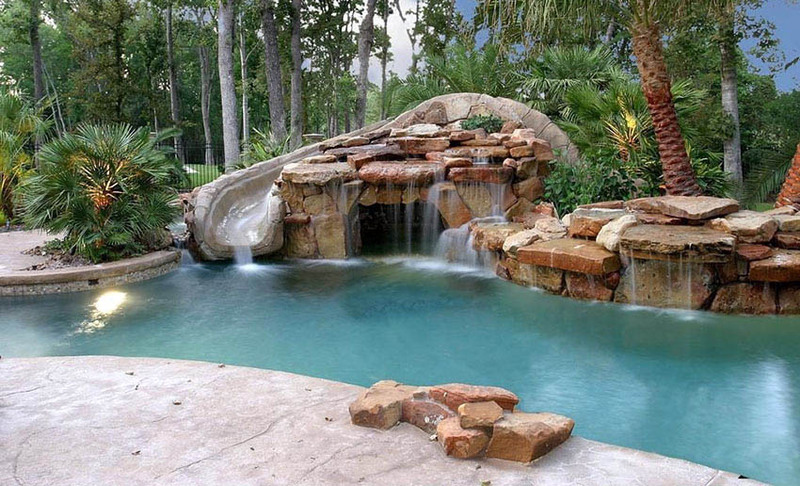 Multi-level waterfall features add another dimension to your lagoon style pool. Installation or renovation of lagoon style pool designs depends on the overall feel you’re seeking to recreate. Homeowners will most often look for that tropical, beach-type ambiance for their lagoon pool design setup. The more common landscaping vegetation elements that are integrated into lagoon pools consist of tropical plants such as palm trees, hibiscus plants, birds of paradise, and princess flowers. Lush vines are also commonly utilized throughout the surroundings of the pool. Ask your local planters and landscape architects of the best species to use for your lagoon pool. Pool fountains are also popular design choices for these types of pools. The same goes for other water features such as bubblers and the aforementioned landscape waterfalls. Pool size and shape, available space, and allowed budget are factors to consider when going for these types of pool design features. Pavers used on lagoon style pools also affect the overall look of the area. The more commonly suggested paver material would be light-colored travertine stone. They’re pleasant on bare feet, functionally non-slip, aesthetically pleasing, and enduringly timeless. Many lagoon pool designs also employ wading pools or spa areas. Young children will benefit from these areas where wading can be done safely. You can choose to create a multi-level layout for lagoon pools and take your design to a whole other dimension. Bridges, stairways, and elevated walkways will work well for these types of layouts. With ample yard space and sloping topography, you cane make lagoon pools with rock faces as tall as this one. Tanning ledges and wading areas make for great play areas for children. Adding an infinity lagoon pool in seaside locations make you feel as if you’re wading in the sea itself. You can separate hot tubs from the pool proper with rock design features. Tropical trees give lagoon style pools a more organic and natural look. Underwater neon lights make your lagoon style pools pop at night. 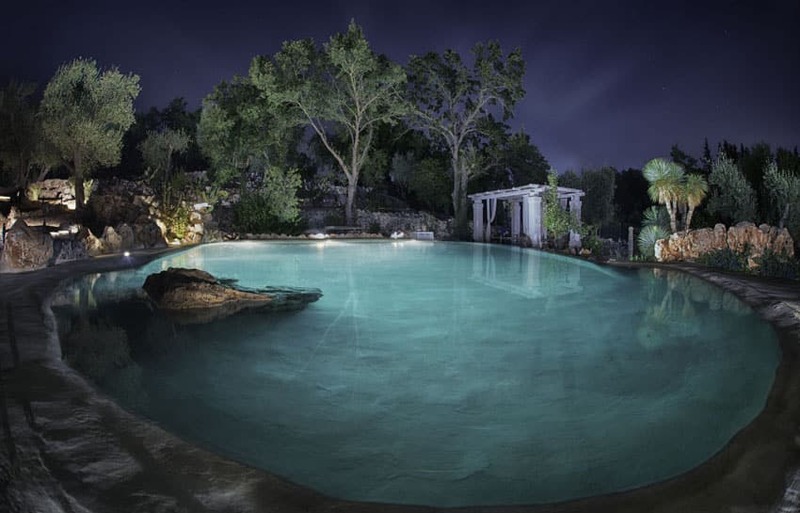 Ample lighting for lagoon pools are stylish and functional for nighttime pool parties. 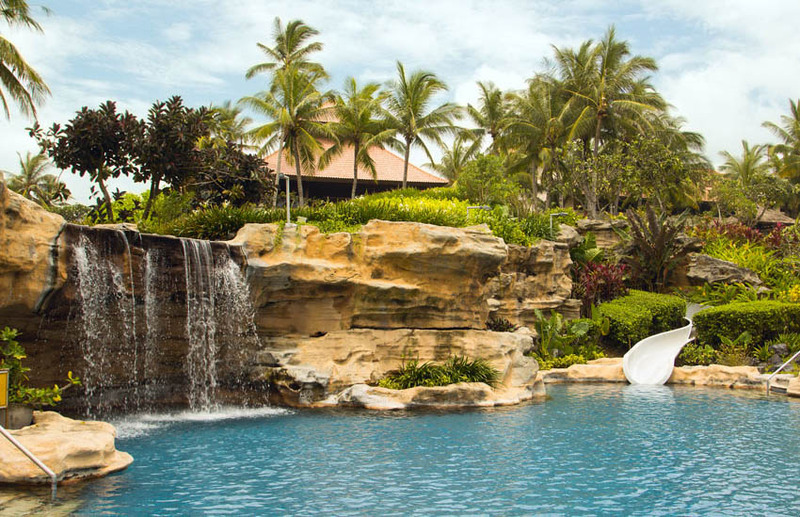 For an added layer of fun, poolside slides can be added on top of existing rock features. Curvilinear sides of lagoon style pools can accommodate integrated spas and hot tubs quite easily. Rock floors, edges, and waterfall features are the integral design elements of most lagoon style pools. Fountain features can be a great addition to any lagoon style pool design. 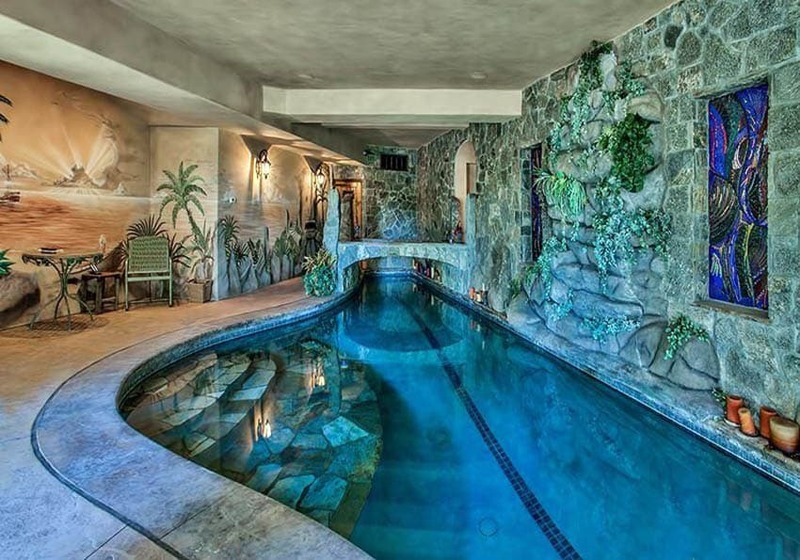 Indoor lagoon style pools bring a bit of the outdoors under a roof. This pool has a stunning rock entry with gorgeous blue surface and rock bridge. Lagoon style pools are great for backyards looking to complement existing design elements. 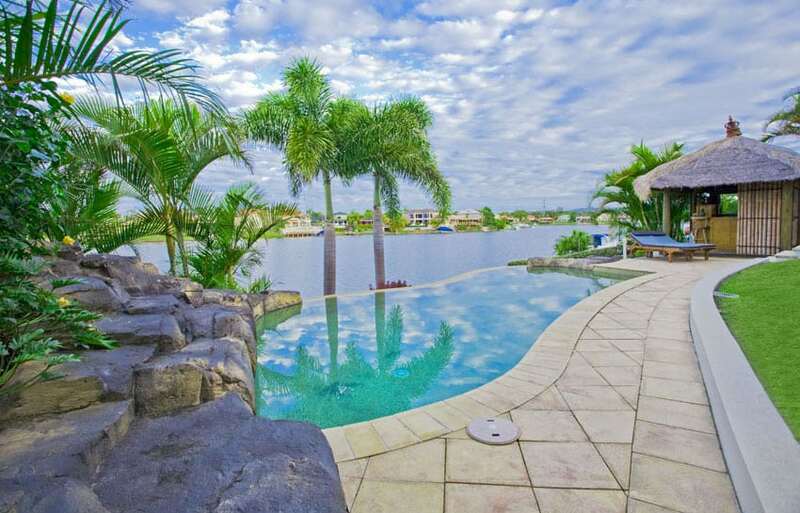 This beautiful backyard has a hot tub overlooking a lagoon pool with rock border and elegant gazebo. Longer lagoon style pools are perfect for long but narrow backyards. A straight edge side allows the freedom of swimming laps and is more efficient for meeting a patio space. 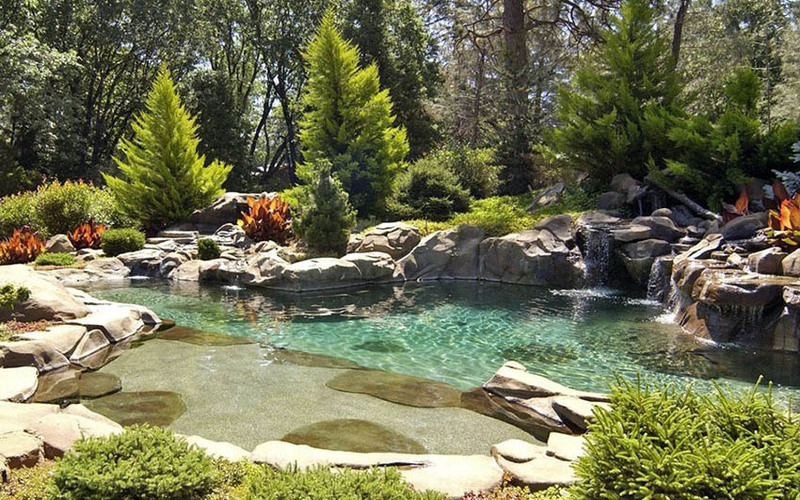 Fenceless forest side backyards can utilize lagoon pools that seem to seamlessly blend in with the surround greenery. 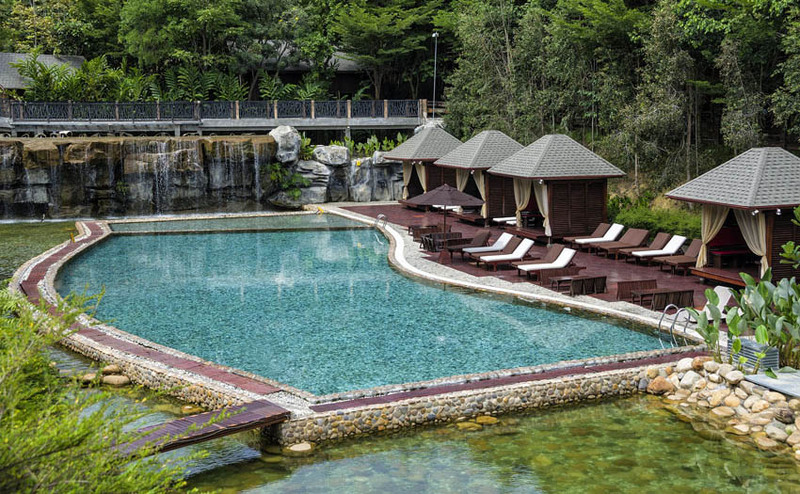 This lagoon pool features an abundance of waterfalls with a shallow wading area for children. Even smaller sized pool layouts can use a corner of the pool for spas or hot tubs. A gas firebowl makes a dramatic impression at night and really increases the ambiance of the pool. Cove features are good for intimate, relaxing moments for pool users. 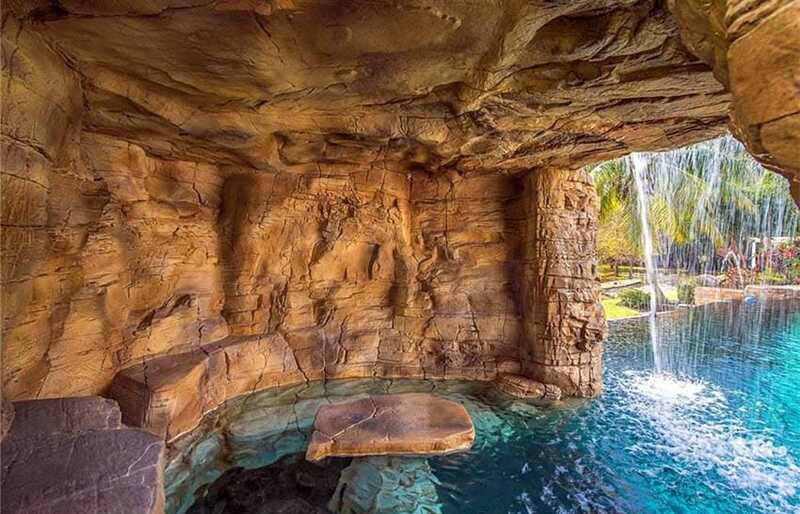 This impressive swimming pool grotto with waterfall provides a cool place to escape the sun and enjoy an exotic viewpoint. You can be creative when integrating cove features and pool slides. Here we have an example of a pool slide, waterfall feature, and cove feature all in one design element. Smaller lagoon pools are perfect for yards with limited space. With the freeform flexibility of these types of pools, the possibilities are endless. Smaller pools are perfect for light wading before or after a swim at the beach. This oceanfront backyard provides a modern deck surrounding a green bottom pool to mimic the look of a tropical oasis. Lounge chairs are positioned in the water to maximize views and relaxation. With limited space, you could choose to employ just one accent vegetation landscaping element to give your pool some shade. This small backyard villa creates the perfect spot for a private swimming pool. Integrating stilts or columns into the pool is a smart way to give your pool design some appeal. 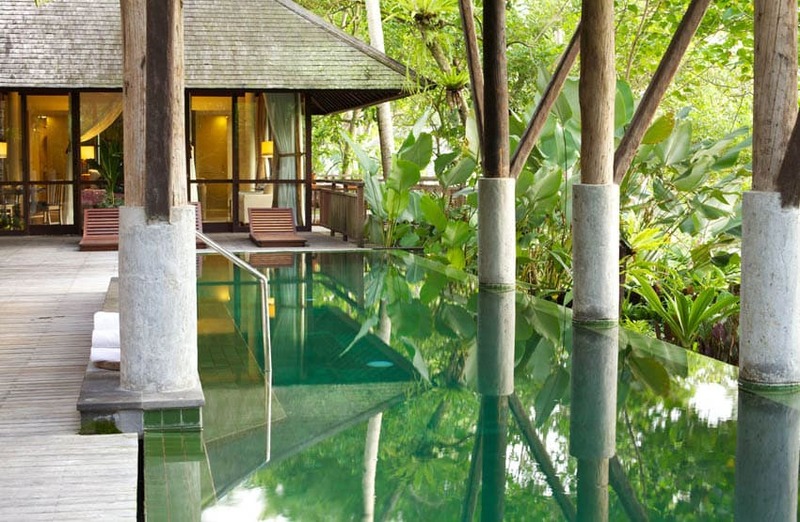 This elevated swimming pool looks out upon a real tropical jungle to create the perfect backdrop for an exotic escape. Having poolside bars and letting your lagoon pool bleed into the underside of your house are great ideas to maximize space. This pool’s large rock wall is visually stunning and gives the feeling of being in a natural pool. Open air backyard pool setups are good for sunbathing and getting some light tanning done. 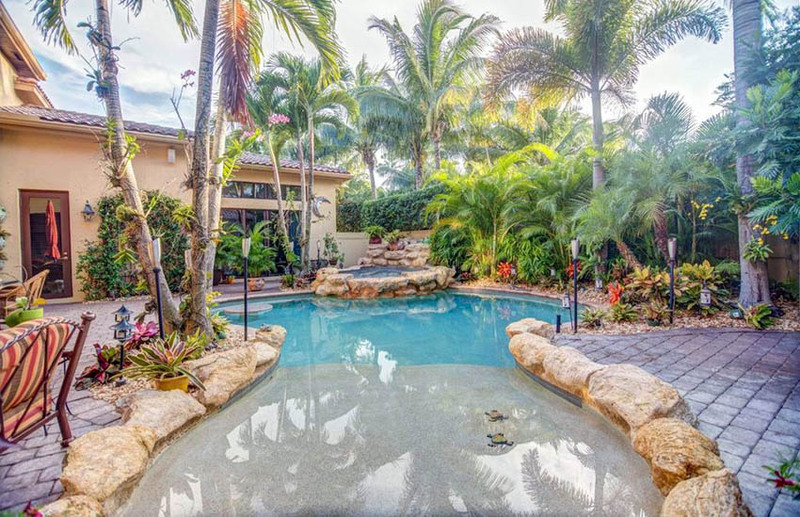 This rock pool with waterfall has beautiful tropical landscaping with palm tress to create an inviting backyard oasis. Reflective lakeside lagoon pools really add a certain ambiance that not many other landscape features can achieve. A tikit hut off to the side is a great place to escape the heat and seek cocktails and some shade.